I love Google's new search prediction system. You start typing in a word in the search box, like "When was..." (because I'm trying to find out when Ghostbusters 2 came out, for examps) and this is what Google thinks I want to search for, which is hilarious. 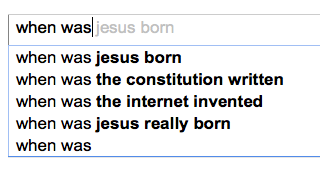 No, when was Jesus REALLY born. Well, last night my boyfriend and I were trying to figure out if James Franco was gay. Plain and simple. Is he? He could be. Maybe he's just down with himself. Anyway, let's just search for it, I'm sure when we Google it, some blog will come up WELL HELLO SEARCH PREDICTION! WE DIDN'T EVEN FINISH WITH THE WORD FRANCO AND GOOGLE ALREADY KNEW!!!!! Is James could have been the start of so many searches: Is James Taylor alive? Is James Earl Jones the voice of Mufasa? Is James Buchanan considered the worst president ever? (that's actually yes, I know that because I went to an elementary school in his name). But NO, Google went there!! Which means James Franco must ACTUALLY be gay! !